Everyday New York offers us people, images, and moments that breeze right by, but also moments that break into our understanding and settle into our hearts. 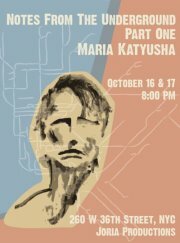 “Maria Katyusha” is a multidisciplinary exploration on how war affects lives and the internal struggles that make love a battlefield every day. Notes from the Underground. Part One. When a Soldier leaves loved ones behind to go off and fight, feelings of love, longing, and hope connects them to one another’s hearts where love keeps burning, like those “home fires” kept alight. Could these feelings reverberate in civilian society when someone is left behind in the wake of life circumstances, divorce, sickness or death? Art will be shown as an introductory reception to the piece.